Self care is a topic that seems to be getting more mainstream, and for good reason. Taking proper care of ourselves and making a deliberate effort to prioritize our wellbeing is not only essential for our health, but it allows us to show up better every day. Over the past few months, I’ve shared a few blog posts about practicing self care, including the different types. So for today’s post, we’re going to focus on spiritual self care, one of the dimensions many of us don’t know much about. And if you’re interested in finding out what type of self care to prioritize, take my fun quiz now! 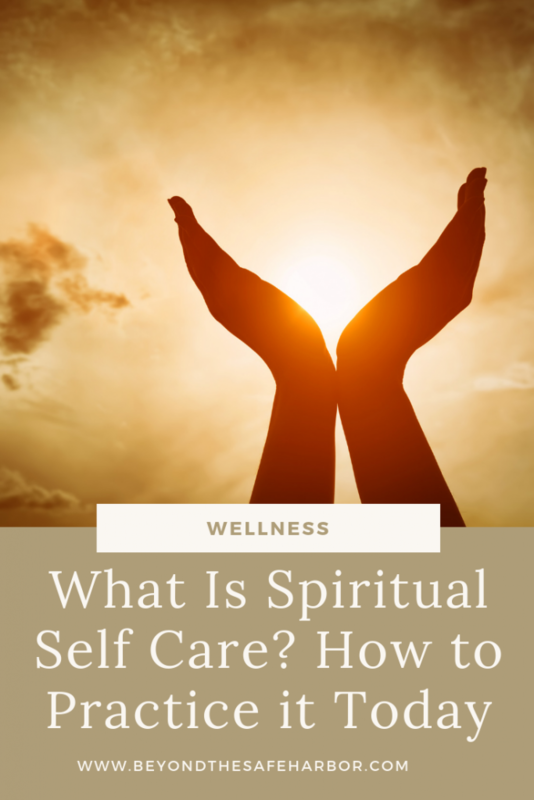 What is Spiritual Self Care? Spiritual self care is comprised of actions we take to deepen our connection with our higher self: who we truly are. This part of ourselves is the REAL us, driven by our deep desires and what matters most to us at our core. It’s separate from the ego, and is instead driven by the soul. Practicing spiritual self care not only leads to greater inner peace, but it can help us live in greater alignment with our core values. Here are some strategies for practicing spiritual self care. We talked about this practice in my post 5 Simple Ways to Practice Emotional Self Care Now. While meditation has numerous benefits, it can truly be a spiritual practice and one that connects you to your higher self. Because it involves calming your mind and disconnecting from thoughts, you’re able to more easily ground yourself and also receive any divine guidance. It eliminates the noise (driven by your ego!) and creates space for you to just be. Listening to the Headspace app. They have a 10-day meditation guide that’s absolutely free, and can help teach you the basics. Finding a quiet space and focusing on either your breath, a mantra, or on counting to 10 (and then starting back again at 1). Listen to a guided meditation. I personally love the meditations on the Insight Timer app. As I shared in my post 5 Easy Ways to Practice Gratitude Every Day, this is something I’m really passionate about. Whether it be keeping a gratitude journal, making it a daily ritual to reflect on what you’re thankful for, or going out and thanking those you appreciate, there are multiple ways to make gratitude a regular practice. By practicing gratitude, you focus on positive things, raising your vibration and increasing the likelihood of more good being manifested into your life. And it connects you with what’s most important which is all about your higher self! For more tips on how to incorporate a gratitude practice into your life, check out 5 Easy Ways to Practice Gratitude Every Day. #3. Spend time in nature. This is one practice I have to say I could be better at. I’m not really outdoorsy myself, and living in a cold climate, it’s not always a delight to go for a walk when it’s -20 C outside. But there are major benefits to spending time in nature, especially when it comes to our spiritual sides. By immersing yourself in nature, you’re able to disconnect from the noise of everyday life, connect with your senses, and be in solitude. It can also help with mindfulness. #4. Attend a religious service. Participating in group prayer or meditation works on so many levels. It gives us a sense community, reinforces our values and beliefs, and connects us with something greater than ourselves. If you’re not particularly religious, don’t fret! I’ve found these benefits through group meditation and group coaching sessions. These are all about connecting with likeminded people and the experience is healing and empowering. Not sure where to start? Look for a meditation group or religious meeting in your community – one that aligns with your values. Try it out and see how you feel. It may be outside your comfort zone, but that’s all the more reason to give it a shot. You can also pray or set intentions by yourself if that’s more up your alley. So much about spiritual self care and connecting to your higher self is honouring yourself and your self worth. But how can you incorporate that into your everyday life? Wear those fancy earrings you would normally save for a special occasion. Cook yourself an indulgent meal, just because. Little things like that can make a big difference in how you feel about yourself and the magic around you.